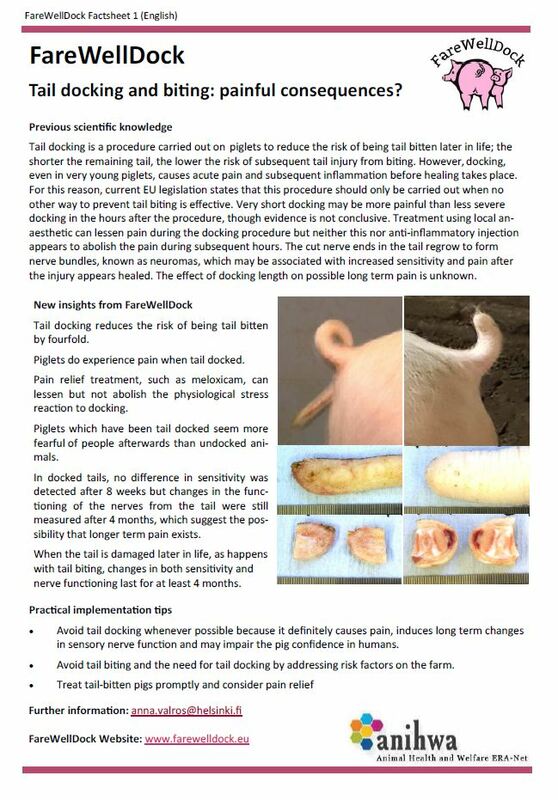 Concerns exist that docking and biting injuries may be a cause of long term pain in the remaining tail stump during the pig’s lifetime. The potential for long-term pain has been linked to sustained cellular and molecular changes in peripheral sensory neuronal activity. The aim of this study was to conduct a transcriptome analysis of caudal dorsal root ganglia (DRG) gene expression profiles from pigs subjected to tail amputation, in particular examining genes known to be associated with inflammation and neuropathic pain. Microarray analysis was performed on caudal DRG from sham (control) and tail amputated pigs 1, 8 and 16 weeks after tail treatment at either 3 days (neonate) or 63 days (juvenile). Tail amputation injury induced highly significant gene expression changes (both up and down) compared to sham-treated intact controls at both ages (518-2,794 genes, FDR < 0.05) that were still evident 16 weeks after tail amputation. Network correlation analysis using the Markov clustering (MCL) algorithm to define expression modules revealed two highly correlated (PCT r2 = ≥0.75), interrelated transcript expression clusters related to (A) neuronal function (759 genes) and (B) wound healing (273 genes). In cluster A, gene ontology (GO) and pathway enrichment analysis identified genes with significant GO terms for voltage- and ligand-gated ion channel activity linked to regulation of membrane potentials, neurotransmitter levels and synaptic signalling. In cluster B significant gene expression was associated with receptor binding, protein transcription activity and regulation, linked to processes such as response to wounding, regulation of response to wounding, inflammatory response and activation of immune response. Cross-reference against an integrated database of known genes involved in the regulation of inflammatory and neuropathic pain revealed 124 and 61 pain–associated genes in clusters A and B, respectively. Key functional families of ion channels and receptors were significantly down-regulated in cluster A, in particular voltage-gated potassium channels and GABA receptors which are linked to increased neuronal excitability. Up-regulated functional gene families in cluster B were mostly linked to inflammation, macrophage activity, neurohormone and opioid peptide activity. DRG gene expression profiles appear to be linked to sustained tissue inflammation and remodelling (ca. 4 months) and pain perception modulation consistent with adaptive, compensatory responses to injury induced increases in peripheral sensory neuron excitability in the injured tail stump. Tail amputation causes acute and sustained changes in peripheral somatosensory nerve function involving inflammatory and neuropathic pain pathways which have implications for pig welfare. Determination of stable reference genes for RT-qPCR expression data in mechanistic pain studies on pig dorsal root ganglia and spinal cord. By Sandercock DA, Coe JE, Di Giminiani P, Edwards SA. 2017. Res Vet Sci. 2017 Sep 28;114:493-501. RNA expression levels for genes of interest must be normalised with appropriate reference or “housekeeping” genes that are stably expressed across samples and treatments. This study determined the most stable reference genes from a panel of 6 porcine candidate genes: beta actin (ACTB), beta-2-microglobulin (B2M), eukaryotic elongation factor 1 gamma-like protein (eEF-1), glyceraldehyde-3-phosphate dehydrogenase (GAPDH), succinate dehydrogenase complex subunit A (SDHA), Ubiquitin C (UBC) in sacral dorsal root ganglia and spinal cord samples collected from 16 tail docked pigs (2/3rds of tail amputated) 1, 4, 8 and 16weeks after tail injury (4 pigs/time point). Total RNA from pooled samples was measured by SYBRgreen real-time quantitative PCR. Cycle threshold values were analysed using geNorm, BestKeeper and NormFinder PCR analysis software. Average expression stability and pairwise variation values were calculated for each candidate reference gene. GeNorm analysis identified the most stable genes for normalisation of gene expression data to be GAPDH>eEF-1>UBC>B2M>ACTB>SDHA for dorsal root ganglia and ACTB>SDHA>UBC>B2M>GAPDH>eEF-1 for spinal cord samples. Expression stability estimates were verified by BestKeeper and NormFinder analysis. Expression stability varied between genes within and between tissues. Validation of most stably expressed reference genes was performed by normalisation of calcitonin gene related polypeptide beta (CALCB). The results show similar patterns of CALCB expression when the best reference genes selected by all three programs were used. GAPDH, eEF-1 and UBC are suitable reference genes for porcine dorsal root ganglia samples, whereas ACTB, SDHA and UBC are more appropriate for spinal cord samples. Characterization of short- and long-term mechanical sensitisation following surgical tail amputation in pigs. By Pierpaolo Di Giminiani, Sandra A. Edwards, Emma M. Malcolm, Matthew C. Leach, Mette S. Herskin & Dale A. Sandercock. 2017. Nature Scientific Reports. Commercial pigs are frequently exposed to tail mutilations in the form of preventive husbandry procedures (tail docking) or as a result of abnormal behaviour (tail biting). Although tissue and nerve injuries are well-described causes of pain hypersensitivity in humans and in rodent animal models, there is no information on the changes in local pain sensitivity induced by tail injuries in pigs. To determine the temporal profile of sensitisation, pigs were exposed to surgical tail resections and mechanical nociceptive thresholds (MNT) were measured in the acute (one week post-operatively) and in the long-term (either eight or sixteen weeks post-surgery) phase of recovery. The influence of the degree of amputation on MNTs was also evaluated by comparing three different tail-resection treatments (intact, ‘short tail’, ‘long tail’). A significant reduction in MNTs one week following surgery suggests the occurrence of acute sensitisation. Long-term hypersensitivity was also observed in tail-resected pigs at either two or four months following surgery. Tail amputation in pigs appears to evoke acute and sustained changes in peripheral mechanical sensitivity, which resemble features of neuropathic pain reported in humans and other species and provides new information on implications for the welfare of animals subjected to this type of injury. See also our article in PigProgreess. The FareWellDock factsheets are out. Below you find the cover factsheet as well as the factsheets on tail docking, enrichment, health and the prediction of tail biting. This post shows images of the English versions, and links to the pdf version of the English factsheets, as well as all factsheets in Danish, Dutch, Finnish, French, Italian, Norwegian and Swedish. Separate pages are available directly showing the factsheets in the other languages (Danish, Dutch, Finnish, French, Italian, Norwegian and Swedish). By M.S. Herskin, P. Di Giminiani, K. Thodberg, 2016. Research in Veterinary Science 108: 60–67. Lidocain reduced signs of procedural pain during tail docking in piglets but did not affect behaviour during 5 h after the procedure. Meloxicam had only very marginal effects on behaviour of the piglets during and up to 5 h after tail docking. Tail docking led to behavioural changes throughout the 5 h observation period. 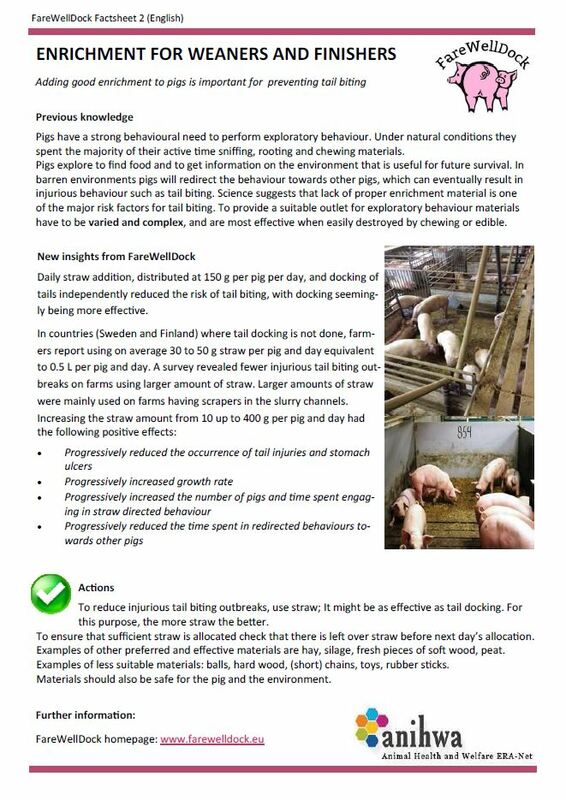 Tail docking length affected procedural and post-procedural behaviour of the piglets. In many countries, piglets are tail docked to prevent tail biting. The aim of this study was 1) to evaluate the efficacy of a local anaesthetic and/or NSAID to reduce pain caused by tail docking; and 2) to examine interactions with docking length. 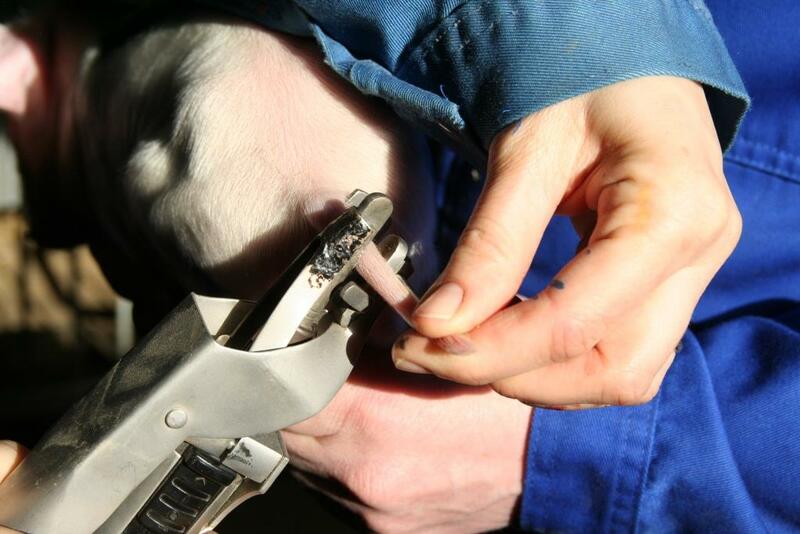 This was examined in 295 piglets docked by hot iron cautery 2–4 days after birth and based on behaviour during docking as well as the following 5 h. The study involved three main factors: local anaesthetic (Lidocain), NSAID (Meloxicam) and docking length. Either 100%, 75%, 50% or 25% of the tails were left on the body of the piglets. Irrespective of the tail length, tail docking led to signs of procedural pain, which could be reduced by administration of Lidocain. Preemptive use of Meloxicam did not affect the signs of procedural pain. The results show that tail docking led to behavioural changes throughout the 5 h observation period indicating that effects of this management routine are more persistent than earlier suggested, and suggesting that docking length may influence the post-surgical behaviour of piglets. By use of the present sites of injection and dosages, neither local anaesthetic nor NSAID had marked effects on post-surgical behavioural changes induced by tail docking. Hence, if tail docking is to be performed, more research is needed in order to develop practical methods for on-farm piglet pain relief. What are the effects of tail docking on piglets? What are the effects of tail docking on piglets? Interview with Dr Pierpaolo Di Giminiani by Vincent Ter Beek in Pig Progress (August 8, 2016). Here you find the first half of the interview. The whole article can be found on Pig Progress. The practice of tail docking is applied to young piglets to avoid a potential later problem of tail biting. But are there effects of docking on piglets? Very few researchers have asked that question, found Dr Pierpaolo Di Giminiani, researcher at Newcastle University, UK. Is a tail actually a sensitive part of the pig’s body? Dr Pierpaolo Di Giminiani thinks for a while and says, “That is a very good question! I would say it is not more or less sensitive than other parts of the body. The tail is full of neuro-anatomical structures responsible for the pain response. It is comparable to our human skin.” Unlike in many other animals, the pig’s tail may not have a wide range of functions. At best it serves to chase insects away and when in a curl, it gives an indication of the animal’s health. Still, when something happens to that tail, whether this be being docked or bitten, this body part responds like any other. Dr Pierpaolo Di Giminiani is a research associate with a focus on ethology (animal behaviour) at Newcastle University, UK. During his graduate studies at Linköping University in Sweden, he studied the cognitive impairment caused by anaesthetic protocols in rodents. At his doctorate at Aarhus University, Denmark, he focused on the assessment of behavioural measures of pain in pigs as a result of cutaneous inflammation. Currently, he investigates pain in pigs in relation to the practice of tail docking in piglets and tail injuries in older pigs. Tail docking – and especially the effects of tail docking on piglets – has been the focus of Di Giminiani’s studies since the beginning of 2014. They form part of the FareWellDock research programme, an international conglomerate funded by the European Union, zooming in on the common problem of tail biting, the preventive solution of tail docking, virtually common everywhere in Europe, and what can be done to overcome both. Especially tail docking of piglets is a practice which is increasingly frowned upon in some European countries. For more information on FareWellDock, see box below. In many other animal studies, Di Giminiani explains, research on pain sensitivity is fairly common. Before he set himself onto the theme of pain in piglets, an academic journey took him from his native Italy to San Diego, United States and later Linköping, Sweden, to learn and discover more on pain perception in laboratory rodents. In pigs, however, everything was different, he says, as similar research appeared to be virtually absent in pigs when starting his PhD in Denmark at Aarhus University. Indeed, a bit strange, considering that pigs have an important role to play virtually all over the world – and considering the fact that from a medical perspective, pigs and humans are very similar. Is pain actually occurring or not and how long does it last? What is the level of pain experience for piglets? Based on the outcome, what can be done – for instance the use of painkillers? To observe spontaneous behaviour. You just observe the activity of the animals, e.g. how much they walk – their locomotion – how much they lie, how much they stand, how do they drink, how do they eat, etcetera. “Another method revolves around stimulus and reception – how do animals react to certain controlled challenges? We apply a controlled challenge to evoke a reaction.” This last method had not been applied in pigs a lot, but was used at Newcastle University to figure out short and long-term effects of tail docking on piglets. Di Giminiani’s research team applied a gas-heated iron for tail docking, so that any wound would immediately be closed to avoid infections. 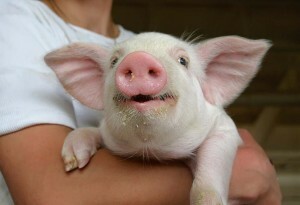 He says, “In addition to measuring responses to controlled stimuli, we developed a grimace scale to measure the facial expressions of piglets. They do seem to grimace, particularly that they squint with their eyes in the minutes immediately following tail docking.” A full scientific paper related to the findings will be sent for publication in the summer of 2016. For the last three sections of this interview (Pain in animals in the longer term; Does it matter? ; FareWellDock) see the original article, as well as several related articles, on the Pig Progress site. The perception of pain by pigs and implications for farm and veterinary practice. Edwards, S., 2016. 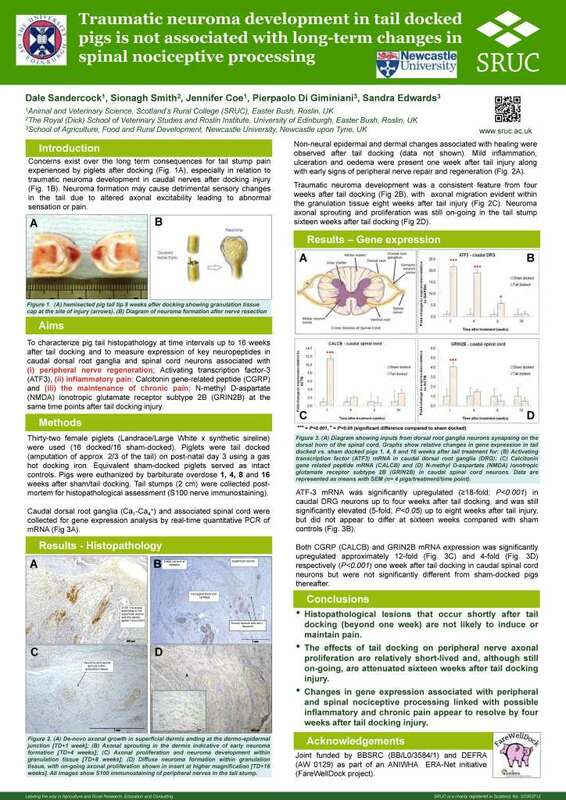 Royal Dublin Society: Abstracts book of the 24th International Pig Veterinary Society (IPVS) Congress, Dublin, Republic of Ireland 7-10th June 2016. p. 13-17. “Freedom from pain, injury and disease” is one of the fundamental aspects of good animal welfare. However, in commercial pig production there are a number of situations where animals may experience pain. This may result from procedures carried out deliberately for management purposes, or from spontaneous health disorders. In order to make decisions on the ethical justification of procedures and the provision of pain alleviation by appropriate anaesthesia and analgesia, it is necessary to assess the intensity and duration of pain experienced by the animals. A number of behavioural, physiological and molecular methods now exist for such assessment but, since pain is a subjective experience which the individual may express in different ways, interpreting these measures can be a challenge. Better methods are required for the practical on-farm assessment of pain and the provision of analgesia when this occurs. Paper available in the proceedings. Traumatic neuroma development in tail docked piglets is not associated with long-term changes in spinal nociceptive processing. By Sandercock, D., S. Smith, J. Coe, P. Di Giminiani, S. Edwards, 2016. 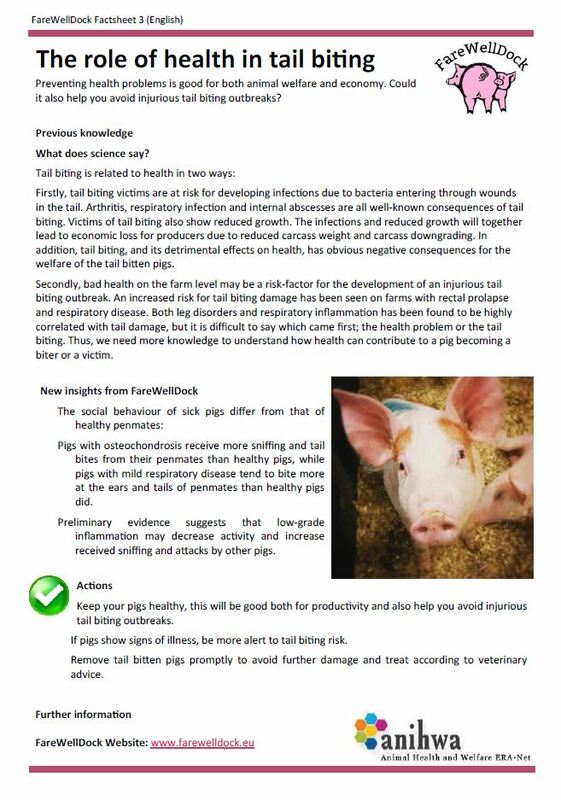 Royal Dublin Society: Abstracts book of the 24th International Pig Veterinary Society (IPVS) Congress, Dublin, Republic of Ireland 7-10th June 2016. p. 611. 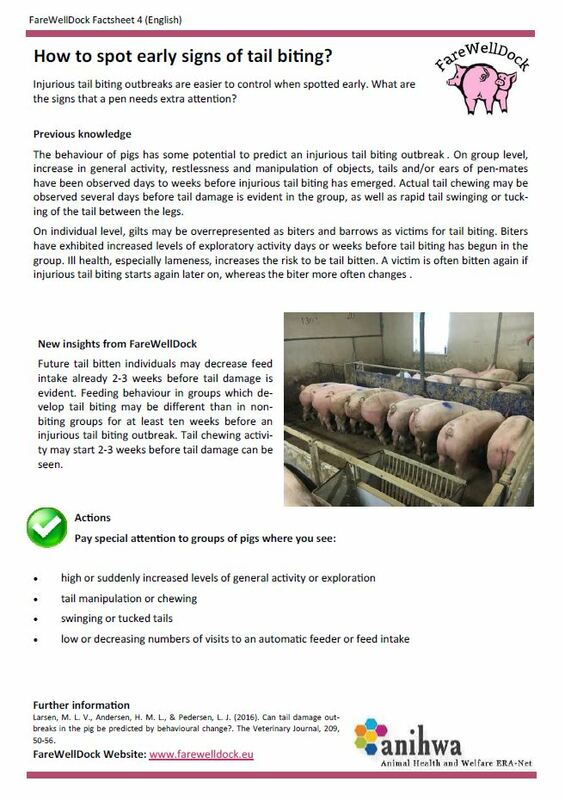 Introduction: Concerns exist over the long term consequences for tail stump pain experienced by piglets after docking, especially in relation to traumatic neuroma development in caudal nerves after docking injury. Neuroma formation may cause detrimental sensory changes in the tail due to altered axonal excitability leading to abnormal sensation or pain. Aims: To characterize pig tail histopathology at time intervals up to 16 weeks after tail docking and to measure expression of key neuropeptides in caudal dorsal root ganglia and spinal cord neurons associated with (i) peripheral nerve regeneration; activating transcription factor-3 (ATF3), (ii) inflammatory pain; Calcitonin gene-related peptide (CGRP) and (iii) the maintenance of chronic pain; N-methyl D-aspartate (NMDA) ionotropic glutamate receptor subtype 2B (GRIN2B) at the same time points after tail docking injury. Materials and Methods: Thirty-two female piglets (Landrace/Large White x synthetic sireline) were used (16 docked/16 sham-docked). Piglets were tail docked (amputation of approx. 2/3 of the tail) on post-natal day 3 using a gas hot docking iron. Equivalent sham-docked piglets served as intact controls. Pigs were euthanized by barbiturate overdose 1, 4, 8 and 16 weeks after sham/tail docking. Tail stumps (2 cm) were collected post-mortem for histopathological assessment. Caudal dorsal root ganglia (Ca1-Ca4+) and associated spinal cord were collected for gene expression analysis by real-time quantitative PCR of mRNA. Results: Non-specific epidermal and dermal changes associated with healing were observed after tail docking. Mild inflammation, ulceration and oedema were present at 1 week. Traumatic neuroma development was a consistent feature from 4 weeks after tail docking. Neuroma axonal dispersion in the tail stump was on-going 16 weeks after tail docking. ATF-3 mRNA was significantly upregulated in caudal DRGs up to 8 weeks after tail docking, but did not differ at 16 weeks compared with sham controls. Both CGRP and GRIN2B mRNA expression was significantly upregulated 1 week after tail docking in caudal spinal cord neurons but were not significantly different from sham-docked pigs thereafter. Conclusion: Histopathological lesions that occur shortly after tail docking (beyond 1 week) are not likely to induce or maintain pain. The effects of tail docking on peripheral nerve axonal proliferation and dispersion are relatively short-lived and, although still present, are attenuated by 16 weeks after tail docking injury. Changes in peripheral and spinal nociceptive processing associated with possible inflammatory and chronic pain appear to resolve by 4 weeks after tail docking injury.